Exeter City's new manager Matt Taylor says he can't wait to get started although admits there'll be a difficult season ahead. Exeter City have appointed coach Matt Taylor to take over from Paul Tisdale following the announcement that he's to leave. 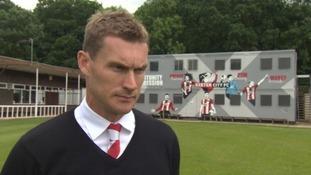 Taylor is a former player at the club and the Grecians current under-23 coach. Tisdale was in charge at the League Two side for 12 years. Last Monday the team were defeated in the Wembley play-off finals for the second time in two years. More details here. The game was called off by referee Brett Huxtable because of a waterlogged pitch with the score at 0-0. The FA Cup draw for the second round has taken place with matches confirmed for Plymouth Argyle, Exeter City and Yeovil Town. The fixtures which will be played on the weekend of December 1st - 4th. Contractors have begun removing asbestos panels as the £3.5m development of St James' Park gets underway. Exeter City's David Wheeler has joined Championship side QPR for an undisclosed fee. The 26-year-old winger had played for City since 2013. Last season Wheeler scored 21 goals in 46 appearances to help the Grecians reach the League Two play-off final at Wembley – a match in which he scored. It was clear following last season’s performances that David was going to have plenty of offers to move forward with his career this summer and, while we didn’t want to see him leave, we are proud of his moving to a Championship club and hope this underlines still further our commitment to player development. David made it clear that he wanted to take this opportunity and once we felt we could be compensated satisfactorily, and make transfer dealings of our own to strengthen, we were comfortable with David’s transfer. We wish him all the best and hope to see him back at St James Park in the future. 21 year-old Ollie Watkins will head to Brentford after being sold for a club record fee by Exeter City. Dean Moxey has rejoined Exeter City following an eight-year absence from St James Park.